Moments ago, President Obama finished speaking at Faneuil Hall here in Boston. And while it's home to Big Papi and my beloved Red Sox, it's also home to the birthplace of health reform in America. The state's progressive vision of universal coverage and the conservative idea of market competition are what formed the blueprint for Obamacare: that everyone should have access to quality, affordable health care, and no one should ever go broke just because they get sick. 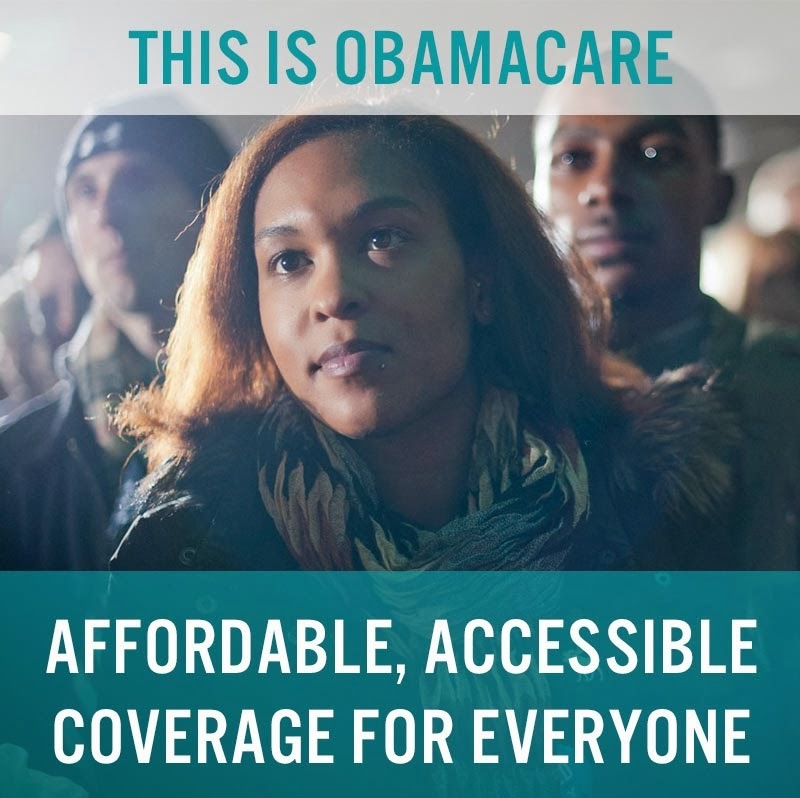 And we're seeing the benefits of reform extended nationally: According to a new report this week, nearly half of single, uninsured Americans between the ages of 18 and 34 can get coverage for $50 or less, often lower than the cost of their cable bill. 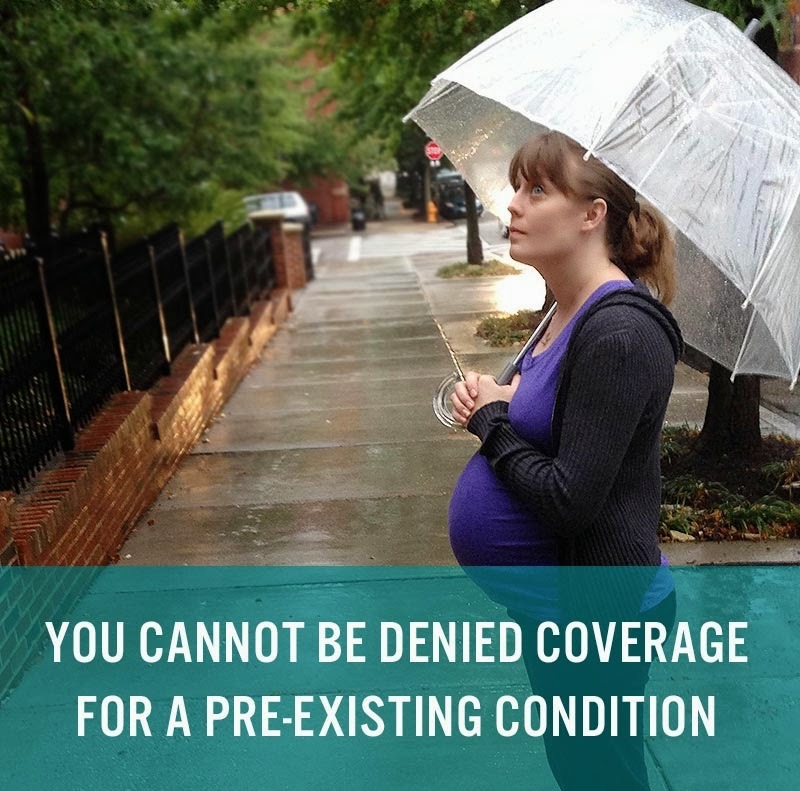 That comes on top of the new benefits -- including free preventive services like mammograms, and a prohibition against denying coverage for pre-existing conditions. Now HealthCare.gov has experienced its share of bumps in the road, to all of our frustration, but every day people are signing up and getting insurance. 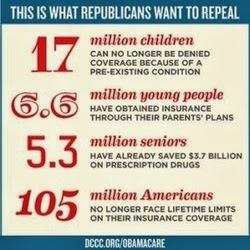 President Obama has said many times that he's open to making the health care law work better. If folks could leave the politics aside for a bit -- if Republicans spent as much energy trying to make the law work as they do attacking it -- we could be much further than we are today. Last week we sat down and spoke with folks who have applied through the Marketplace, and their stories remind me why we fought so hard to pass this law in the first place. Will you take two minutes to watch this video -- and then forward it to a friend? If you want an example of the difference this law will make in someone's life, you don't have to look any further than Janice -- a new registrant from Selbyville, Delaware. She was the first woman to enroll in the Delaware exchange, and she says her new policy will save her $150 a month for more coverage benefits than ever before. Or David -- a self-employed IT consultant and Air Force veteran living in Washington, D.C. David picked his plan the morning D.C.'s online health insurance marketplace opened. His previous plan was $600 a month. His new one? $250 cheaper. That's who we're fighting for here. And while it can get lost in the fray of the 24-hour news cycle, I hope you'll keep folks like Janice and David in mind in the weeks and months ahead. It's just too important to lose sight of the big picture. Take a couple minutes to watch Janice and David tell their stories -- and then pass it on. WASHINGTON, D.C. - Congressman Jim Langevin (D-RI) joined as an original cosponsor of the “Homeowner Flood Insurance Affordability Act,” a bill introduced today that would delay increases in federal flood insurance rates for four years. 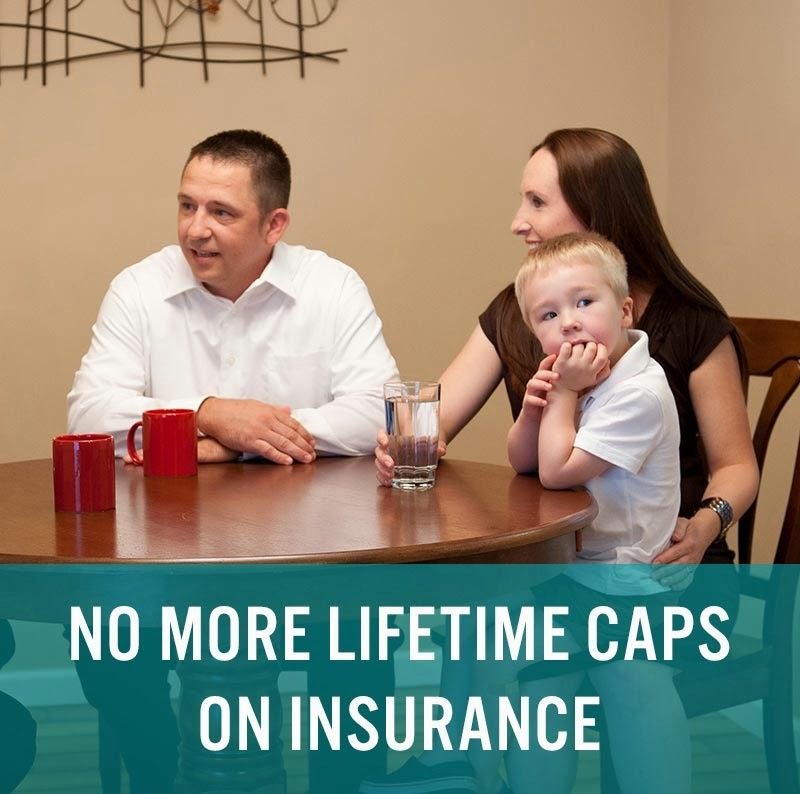 This legislation calls for a two-year affordability study, followed by an additional two-year delay to implementation of new rates mandated in the Biggert-Waters Flood Insurance Reform Act. This delay applies to primary residences, including those sold after July 6, 2012. The Homeowner Flood Insurance Affordability Act requires the Federal Emergency Management Agency (FEMA) to set regulations addressing affordability within 18 months after the completion of the study. The bill eliminates the 50 percent cap on state and local contributions to levee construction or reconstruction; allows FEMA to utilize National Flood Insurance Funds to reimburse policyholders who appeal a map determination; protects the basement exemption that allows the lowest proofed opening in a home to be used for determining rates; and requires FEMA to certify that it has fully adopted a modernized risk-based approach to analyzing flood risk. The bill also establishes a Flood Insurance Rate Map Advocate within FEMA to answer policyholder questions. 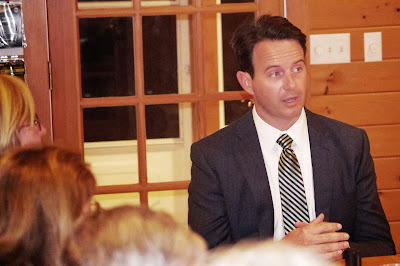 On October 21, the Charlestown Democratic Town Committee continued to meet with candidates vying to run as Democrats for state office. The CDTC completed its meetings with candidates for Secretary of State by meeting with Nellie Gorbea and Guillaume deRamel, the two remaining declared Democratic candidates after Ed Pacheco’s withdrawal from the race. Even though the election is more than a year away, there are many other potential candidates, such as Providence Mayor Angel Tavares, General Treasurer Gina Raimondo, and Clay Pell, grandson of the late Senator Claiborne Pell, who are likely to declare their candidacies for various offices before the end of the year. It’s almost certain that there will be Democratic contenders in the Party’s primary for every statewide office, except perhaps for Attorney General Peter Kilmartin’s seat. Lieutenant Governor Liz Roberts and Secretary of State Ralph Mollis are term-limited. Governor Lincoln Chafee has announced he will not run for re-election. General Treasurer Gina Raimondo is expected to run for Governor. This means a rare occurrence in 2014 when the election guarantees a nearly complete turn-over in the composition of the state’s Executive branch of government. The Secretary of State’s position presents the CDTC with the challenge of evaluating two outstanding people seeking its endorsement. Either would be an excellent Secretary of State based on their past experience and clear thinking about the role of the office. CDTC chair Cathy Collette told them that the committee will discuss which candidate should get their endorsement now that they’ve met with both Democratic candidates. The CDTC will probably make a decision on this race before the end of December, well ahead of the official campaign season. Over the coming months, the CDTC plans to meet with Democrats who have declared their candidacy for the other state general officers’ positions. 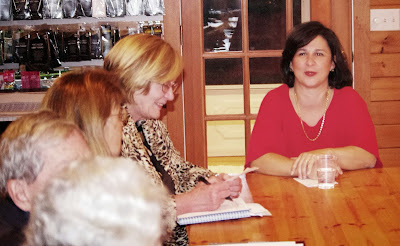 The CDTC meets every third Monday of the month and its meetings are open to all registered Democrats in Charlestown. Remember this government healthcare scandal? And the opposition reaction to this Republican initiative was distinctly different than what we are seeing with the Affordable Care Act today. Read the entire article here at the Daily Kos. On October 1st, even as the federal government was shutting down, HealthCare.gov -- the new Health Insurance Marketplace where people can find and apply for affordable health insurance plans as part of Obamacare -- opened for business nationwide. As you may have heard, the website launch hasn’t gone nearly as smoothly as it should have. And with nearly 20 million visits to the site in the first several weeks, the problems were aggravated by the website's popularity. But even in spite of those problems, thousands of Americans are currently signing up and saving money. Nearly half a million Americans have already applied for health insurance through the federal and state Marketplaces. It's not hard to see why: Once people get through the door, they overwhelmingly like the benefits and cost of the products available to them -- especially when compared with the discriminatory private market that was previously the only game in town. Some of the best and brightest are now doing everything they can to fix the site as quickly as possible. People are working overtime, 24/7, and we've brought in some of the best IT experts from across the country to join the team at the federal agency responsible for running the Marketplace. And as President Obama said today, "Nobody's madder than me about the fact that the website isn't working as well as it should, which means it's going to get fixed." It's also important to remember that the website is not the only way to enroll. You can dial the call center at 1-800-318-2596 and apply directly over the phone. Typically, it takes about 25 minutes for an individual or about 45 for a family. You can also find local "navigators" who can help you enroll in person at LocalHelp.HealthCare.gov. Learn more about what we're doing to make the site better and enrollment easier. The President is the first to admit that the website's problems are unacceptable. But Obamacare is more than just a website. Most Americans already have health insurance through their employer, Medicare, or Medicaid, and they don't need to go to the Marketplace for new coverage. 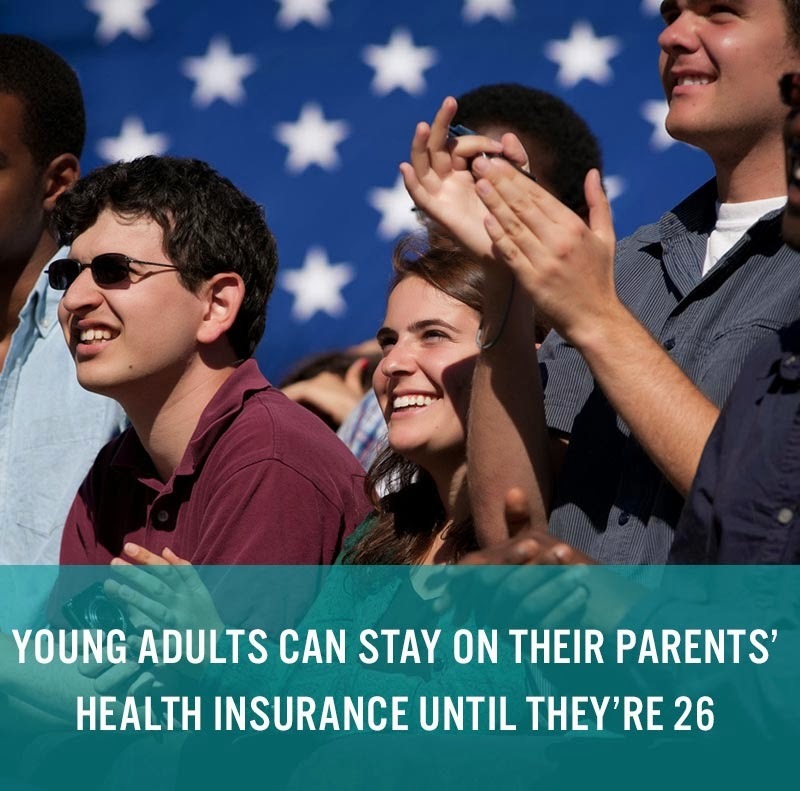 Instead, the health care law provides new benefits and increased protection: Young people can stay on their parents' insurance plans until they are 26, seniors are receiving more affordable prescription medicine, and preventive care like mammograms are free. So while there are major improvements to make on the new website, millions of Americans are already benefiting from the health care law. And we're making sure that those who don't have access to affordable health insurance today can sign up -- online, on the phone, and even in person. If there is one thing that we've learned in these past weeks, it's that the Tea Party will go to great lengths -- including putting the American economy in danger and holding our government hostage -- to destroy Obamacare. To them it doesn't matter that the American public overwhelmingly endorsed these important health care reforms when we re-elected President Obama in 2012; they just want to continue to obstruct the progress that has been made. Let me make something clear: This cannot happen again. As I have in the past, I will continue to stand strong in the face of anyone who believes that the best way to pass legislation is by driving our country to the economic brink -- to govern by directly threatening the livelihoods and well-being of countless Americans. Though a full-blown crisis was narrowly averted, we've still got a lot of work to do. We may have avoided breaching the debt ceiling, but the Tea Party gamble cost us 24 billion dollars in lost American economic activity. They hurt hundreds of thousands of Americans -- including thousands of federal employees and veterans in Rhode Island. Now we need to fix the damage and work towards creating jobs and improving the economy. This has been an especially trying time for all of us, but I want you to know that I will always work to protect Rhode Island families, and I will continue to stand up to the most extreme factions in Congress who are trying to derail our country. Thank you for joining with me in this fight, and for your continued support. "Holding the government and our economy hostage to advance a partisan policy dispute is not how democracy works." 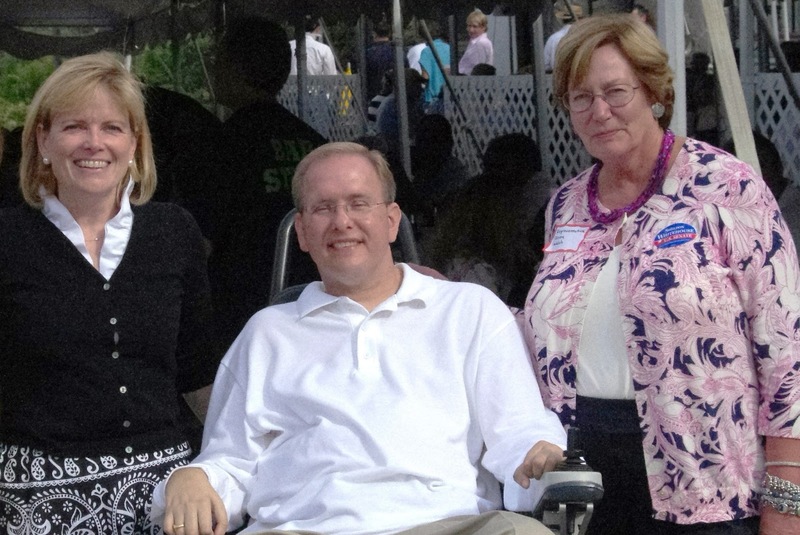 Rep. Langevin with state Senator Cathie Rumsey (l) and Rep.
"The writing has long been on the wall that the extreme ideological agenda of House Republicans to delay or defund health reform is a dead end. The fight over the Affordable Care Act was settled, both in the Supreme Court and in the 2012 election, and yet this futile discussion continues all the way to a government shutdown. “Starting today, millions of Americans who rely on government services will go without, or will see crucial benefits delayed, including assistance through the WIC program, veterans benefits and housing loans for low- to moderate-income families. Hundreds of thousands of federal employees will be furloughed, and others will report to work knowing that no paychecks will be issued during this shutdown. Nationwide, medical research will be suspended and environmental enforcement will come to a screeching halt. Popular sites in Washington, DC, and National Parks across the country will close, inconveniencing visitors and causing a major loss of tourism revenue. Small business owners will not be able to access new SBA loans, and employers won’t be able to use the E-Verify system to screen prospective employees. "Democrats offered a realistic, Senate-passed alternative that represented a true compromise on spending levels while providing an opportunity to keep government running and negotiate a long-term solution. 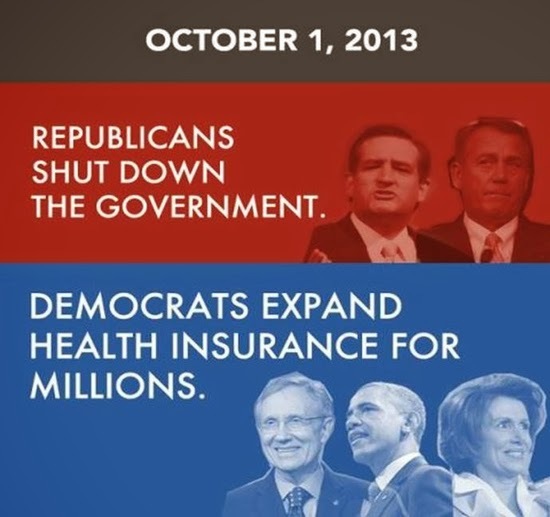 Unfortunately, Republicans refused to accept anything short of a shutdown. Holding the government and our economy hostage to advance a partisan policy dispute is not how democracy works. This is a manufactured crisis and it was completely avoidable. Republicans need to come to the table with a reasonable alternative or it is the American people that will pay the price." Go to RI's on-line health insurance marketplace, HealthSourceRI, by clicking here.